The PsoEasy Treatment Cream is designed to effectively alleviate and control various skin symptoms such as dryness, redness, flaking, scaling and irritation. These symptoms are often caused by skin conditions such as, eczema, psoriasis, atopic dermatitis, and seborrhea. This formula contains over 20 different natural ingredients. 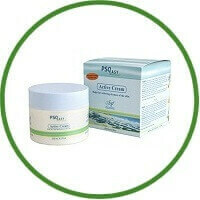 The PsoEasy Treatment Cream is 100% Natural. This product has passed the most strict European tests and standards including the ‘Challenge Test’, Microbial Analysis, Physico-chemical Specifications and the ‘Safety Assessment’. Directions to use: You need to carefully clean the skin, dry thoroughly, and apply PsoEasy Treatment Cream twice a day (morning and evening) for at least two consecutive weeks. With constant use, you will notice cure within a short period of time. It really works.